I think many of you are eagerly awaiting this review. 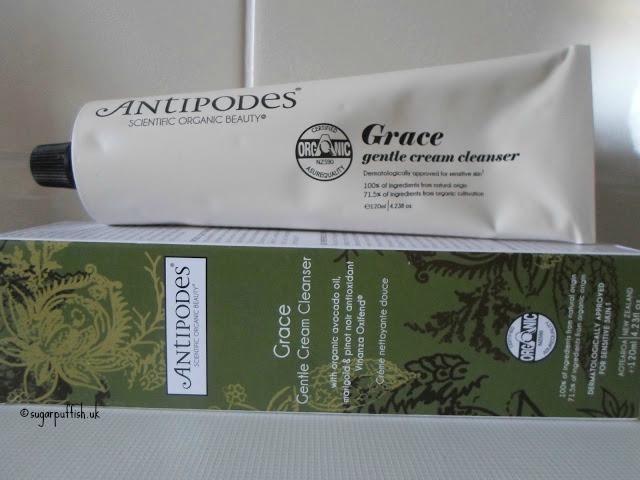 If you watched my recent haul video you will know that I purchase a new cleanser from Antipodes (launched in June) called Grace. This cleanser has my name written all over it as it has been formulated for sensitive skins. I’d finished up my Essential Care cleanser in favour of using Grace as part of my morning and evening routine. Grace is a thick cream, which in my mind makes it feel very luxurious and you can massage into the skin and across the face with ease. The fragrance is similar to the Rejoice Light Day Cream, its sweet and sugary so may not be to everyone’s taste but I like it. I have been applying to dry skin and removing with a damp muslin cloth. If I have layered on the mineral foundation then I will cleanse twice to make sure my skin is thoroughly clean. I can’t vouch for how it works for removing a full face of makeup but I am satisfied it does a decent job on my foundation. Grace is dermatologically approved but I take this with a pinch of salt and would advise patch testing. For me, dermatologically tested or approved is simply a marketing tool and does not mean a great deal to me as a customer with allergies. You may be surprised to hear that but you can still react to a product developed and approved for sensitive skin. Even though I say this, my experience using Grace has been a positive one. I have not noticed irritation and my skin is left feeling soft. Most of you will know Antipodes does not come cheap, but it is certified organic and from New Zealand so perhaps we can justify the price tag. I do feel it’s comparable to Pai. I am not going to mention where I bought mine because I was not impressed with delivery times but a quick google search revealed it’s widely available on websites for around the £24.99 price point (120ml tube). I am really enjoying using Grace, it suits my skin and ethos. I think if you are a fan of Antipodes, cream cleanser or gentle skincare, you are going to want to try this for yourself. I would not say ditch all your cleansers for this one. It does not out perform other cleansers like Essential Care or Pai but it’s on a par with those and worthy of consideration next time you are looking to try something new. Are you an Antipodes fan? Are you tempted to try this? Sounds lovely! I'm really enjoying the Aura mask at the mo! I love Grace! I'm also a massive fan of the Grapeseed Butter Cleanser! Do you use this with a hot cloth?